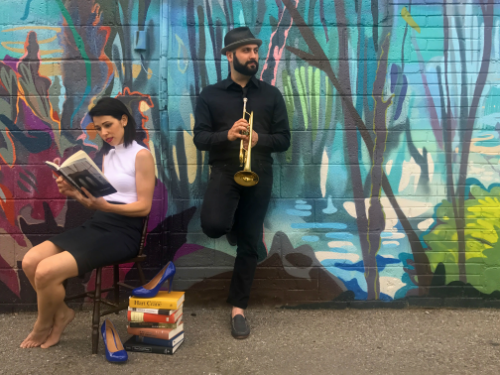 In The Night Hart Crane Kissed Me (playing at the Toronto Fringe Festival), three artists meditate upon the life — and death — of the titular Jazz Age poet, drawing upon music, movement, monologue, magic, and more than a little Mae West to explore his complex legacy. It’s a deeply personal meditation, and that may be the rub. A preliminary: this is an excellent acting company. The three members (Julia Porter, Chai Lavie and Shawn DeSouza-Coelho) move like literal clockwork, and get to shine not only as performers, but as supporters, always elevating and uplifting the person who gets focus at any given moment. But while many of those moments are profound and dramatically interesting, a great many of them are also so personal and so strongly rooted in textual or theoretical elements that this almost felt like an MFA thesis project, rather than something meant for wider consumption — which is to say that, as a Fringe show, I’m not altogether sure I can recommend it to a wide audience. In particular, many of the sequences make very little sense unless you’ve done at least a little preliminary reading of Crane’s life and works. After the show, I encountered a group of people who were expecting a more accessible queer-focused show and were mostly left perplexed. I wouldn’t say they were disappointed: The Night isn’t boring, and these performances are uncommonly strong. Charisma, verve and spectacle can balm over a lot of problems. And, hey, if you’re the one person in a hundred who desperately wanted to catch the Hart Crane show, I’ve got good news! You’ll love it! But I suspect — unfortunately — that a lot of people are going to struggle to connect here. There’s a target audience for this work, and most of us just aren’t in it. Content Warnings: Sexual Content, Smoking, Audience Participation, Mature Language. Photograph of Julia Porter and Chai Levie by Jacob Ahee. I’m quite amazed at the stupidity of this review. It’s shocking and insulting that this reviewer does not wish to be challenged by theatre. Why go to the theatre? I expect this reviewer would be quite satisfied by another remount of Beauty and the Beast. I saw the show and yes, and it was LOVELY. Yes, I am confused by Hart Crane’s poetry. But the show illuminated that poetry through images and dialogue. The ending of the play made me understand Crane’s work. It is a riddle that makes us wonder. That was my revelation from this very special work.